Smooth cheese over one side of each tortilla. Divide remaining ingredients amongst 4 tortillas and cover with remaining tortillas. You now have a quesadilla. What’s a quesadilla? Mexican grilled cheese. Heat a large fry pan over medium high heat. Coat with a little olive oil. This could also be done on a grill pan or bbq. Fry (or grill) quesadillas on both sides until crispy and cheese has melted. Transfer to a cutting board and cut into wedges. Sprinkle with cilantro and serve. Serve on a platter for a stand up party, or with a small salad for lunch. Chop ¼ mango, ¼ red pepper and ¼ red onion into cubes. Add 1 chopped tomato, the juice of ½ a lime, sea salt and pepper. Stir well. 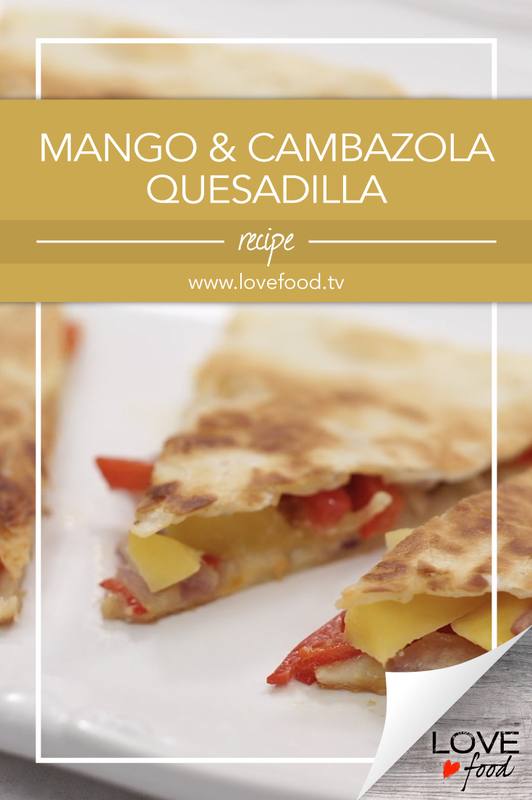 Serve as a side with quesadillas.